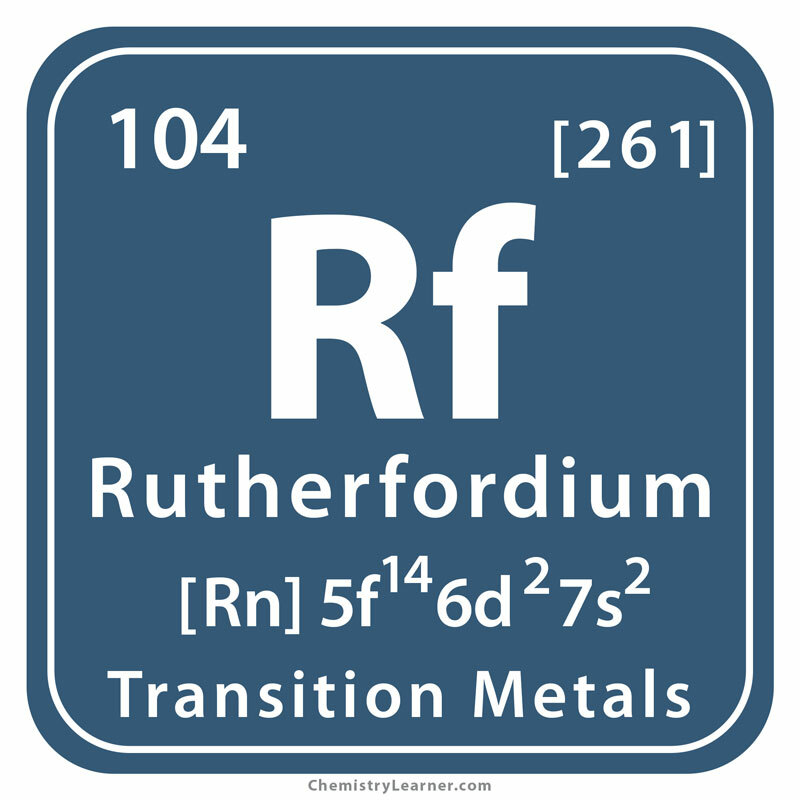 Rutherfordium (pronunciation ruth-er-FORD-ee-em ), represented by the chemical symbol or formula Rf , is a synthetic, radioactive element belonging to the family of transition metals . The most stable of its 15 isotopes is that with mass number 267 that has a half life of 1.3 hours . Rf does not occur naturally on the earth. It is only produced in the lab by the nuclear bombardment of californium 249 with the nuclei of carbon 12 [1, 6]. 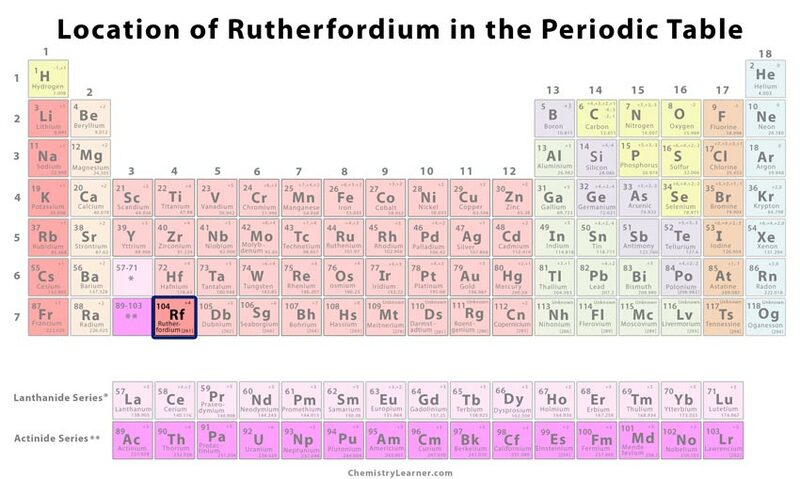 Origin of Its Name: The transuranium element is named after the British chemist, Ernest Rutherford, who is known as the father of nuclear physics and chemistry [1, 3]. 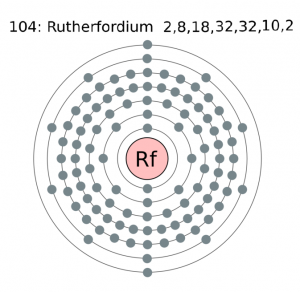 Who Discovered Rutherfordium: It was discovered independently by Georgy Flerov and his colleagues at Dubna, Russia and Albert Ghiorso and his colleagues at Berkley, California, USA . When Was It Discovered: Its discovery year is 1764 . In 1964, Flerov’s team bombarded plutonium with neon and produced isotope 259 of the element at the Joint Institut for Nuclear Research (JINR) in Russia. They confirmed their discovery in 1966. In 1969, Ghiorso and his team made 3 successful attempts at isolating Rf at the Lawrence Berkeley Laboratory (LBL) in USA. One was by bombarding curium with oxygen to form isotope 260, next was by interacting californium with carbon for isotope 257 and finally repeating the same collision to obtain isotope 258. 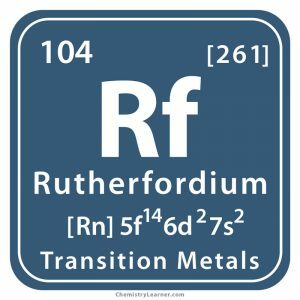 There was a dispute regarding the credit of the discovery and eventually in 1992, the IUPAC decided to recognize both the teams for their claims and name the element Rutherfordium . Since only a few atoms of the element have been synthesized, it only has applications in the field of research . The metal is dangerous due to its radioactivity. Hence, exposure should be avoided [1, 3]. Some of its chemical properties are similar to those of hafnium . The Russian scientists had initially suggested the name Kurchatovium (Ku) for the element after Russian nuclear physicist, Igor Kurchatov. 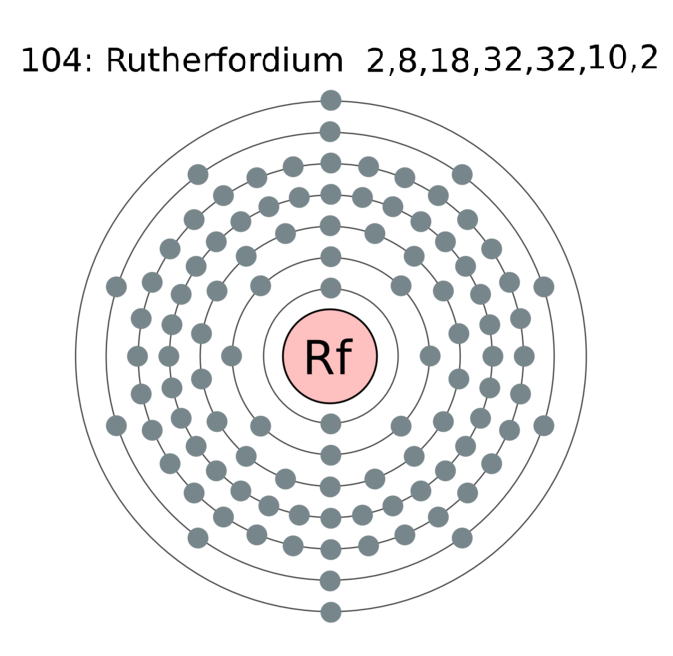 However, the LBL scientists wanted to name it Rutherfordium that was later accepted by the IUPAC . It was given a temporary name unnilquadium (Unq) based on its atomic number before assigning the official name . Unknown as it is not commercially available .